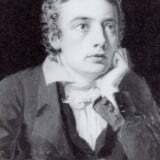 The featured image is of John Keats who was born on October 31, 1795 at Moorgate in the City of London. He died of tuberculosis on February 23, 1821 in Rome, Italy at the age of 25, having published fifty-four poems only four years before his death. At each point in his development he took on the challenges of a wide range of poetic forms, from the sonnet and the Spenserian romance, to the Miltonic epic, defining anew their possibilities with his own distinctive fusion of earnest energy, control of conflicting perspectives and forces, poetic self-consciousness, and occasionally, dry ironic wit. In the case of the English ode he brought its form in the five great odes of 1819, to its most perfect definition. In his own lifetime John Keats would not have been associated with other major Romantic poets, and he himself was often uneasy among them. Outside his friend Leigh Hunt’s circle of liberal intellectuals, the generally conservative reviewers of the day attacked his work with malicious zeal as the work of an upstart. Although Keats had no formal literary education, he is seen today as one of the canniest readers, interpreters and questioners of poetic literature beginning with William Wordsworth — creating poetry in a world devoid of mythic grandeur, that sought its wonder in the desires and sufferings of the human heart. Beyond the difficulties presented him in his own literary education, Keats developed with unparalleled rapidity in a relative handful of extraordinary poems, a rich, powerful, and exactly controlled poetic style that ranks Keats with the William Shakespeare of the sonnets and as one of the greatest lyric poets in English.